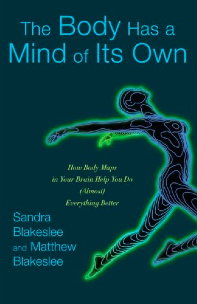 I finished off The Body Has a Mind of Its Own: How Body Maps in Your Brain Help You Do (Almost) Everything Better by Sandra Blakeslee and Matthew Blakeslee -- it's a teriffic read. Here's a review from Amazon that summarizes the book expertly. This is an excellent book. The authors have a gift for making a complex subject understandable. Another plus is that, like the best of nonfiction authors, they stick to the subject and rely on facts rather than opinion. This book provides a wonderful introduction into an area of science formerly limited to neurologists and other highly-trained specialists. For example, have you ever noticed that you can "feel" with the end of a tool? You put a wrench on a nut, and you suddenly have several important bits of information about that nut. This is because your body map extends to include the tool. And it's why mechanics can accurately work without actually seeing what their hands or tools are touching. Body maps extend from the rider to include the horse and from the horse to include the rider. Lovers share body maps, and the book explores what goes on there also. This book explores the effects of dysfunctional body maps, too, shedding light on such things as eating disorders and out of body experiences. And it looks at the interplay between body maps and culture, language, music, emotions, pain, and even parenting. The brain and the body are not separate entities, but are intertwined, interdependent, and interfunctional. Understanding this fact is essential to understanding how and why body maps work. This book explains that lucidly. You may have heard of the "little man" theory, or the homunculus theory. If not, perhaps you recall the drawing of the skull being opened to reveal a little man operating control levers. That drawing represents the theory. We all know there's not an actual physical person of tiny stature pulling levers in our heads. But it's commonly thought that the "me" of us is a central entity that works like that little man. Another common analogy for this theory is the symphony conductor.Because of this theory, many early researchers of body maps looked for the master map. As it turns out, there isn't one. There is no "little man," no master homunculus, no conductor, no central authority. The brain is a collection of homunculi or body maps working together. If this doesn't sound possible, think of an ant colony. There is no master ant giving out directions. Each ant does its part in a concert of ants with no conductor. The many body maps of the brain are similarly independent yet cooperative. The brain also contains body maps that facilitate the communication between these disparate parts and the various body maps those parts use. The Body Has a Mind of Its Own consists of ten chapters. The first chapter gives the reader the background about body maps and how they are everywhere in the brain. Chapter Two talks about the little man theory discussed earlier in this review. Chapter Three talks about how body maps filter and change incoming information to conform to what the map expects to see. You've no doubt heard the expression "People hear what they want to hear." That is a basic aspect of our brain, which is a prediction machine. It's always looking for matches. Just as politicians change the data to match their statements, so quite often does the brain change or filter information so that it matches what the brain expects to see. This is the basis for illusions, and we all know those work. Sometimes these illusions don't serve us very well. One example the book uses is the anorexic who feels fat. This prediction thing isn't all bad -- many self-help experts advise us to imagine ourselves as having already achieved something or to take on some other enabling attitude. Chapter Four takes the concepts of Chapter Three a step further, and looks at why mental practice -- long used by martial artists -- is nearly as effective as physical practice and why when both are done you get a 2 + 2 = 5 effect. Chapters Five and Six explore what happens when body maps blur or break. Some of the manifestations are bizarre. Earlier, I mentioned that when you grasp a tool your body map extends to include that tool. Chapter Eight includes a discussion of this in the broader context of where body maps end. Chapter Seven also talks about where body maps end, but more in terms of how they seek to exclude things that are not part of the body. Sales trainers talk about mimicking other people to win their agreement. In Chapter Nine, we see why this works. Deep in the brain is a structure called the insula. Only mammals have one. In humans, it's massive compared to those of other species (relatively speaking--in whales, body parts are just plain bigger on an absolute scale). The consensus now is the insula is the seat of emotional awareness. Chapter Ten, in discussing the insula, is a fitting last chapter because it is, at least to me, the most profound part of the book. The authors tie everything together in the Afterword, but also raise additional questions that are worth pondering as we search for meaning and purpose in life. Descartes concluded that because he thinks he must exist. Has your human mind has ever contemplated itself, trying to answer the question, "Who am I? Or have you wondered about where in your body your mind actually resides? The Body Has a Mind of Its Own will help you bring some fascinating information to bear on those concepts and many others. Not only is this book thought-provoking, but it helps explain thought itself. How you perceive reality may not be as straightforward as you once thought. Or still think, depending on your body maps. 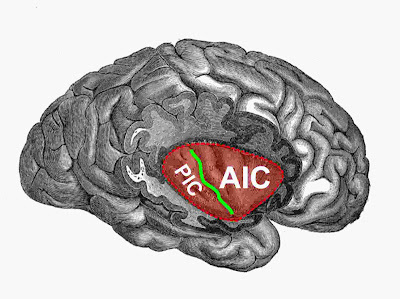 Position of the insular cortex in the human brain shown in red. The parts of the frontal, parietal and temporal lobe that usually cover the insula are removed. The green line indicates the position of the central sulcus of the insula, which separates the larger anterior insular cortex (AIC) from the smaller posterior insular cortex. One of the most mysterious regions of the human brain is the insular cortex, buried in the depth of the lateral fissure, which separates the frontal and parietal lobes from the temporal lobe. For a long while, the insular cortex recieved little attention from neuroscience research. Recently this has dramatically changed: an increasing number of recent studies address the functional role of the insular lobe. A number of reports have connected the insula to important high-level cognitive functions such as error detection, including social norm violation, general task monitoring, language processing, self-awareness and even consciousness. Furthermore, the insula might play a crucial role in neuropsychiatric disorders, such as drug addiction (see for instance the recent New York Times article 'A small part of the brain and its profound effects'). Other studies have proposed more basic functions that might be supported by the insular cortex, including basic auditory processing, experiencing pain, the senses of smell and taste, and simple motor functions.